Also for the ssecondary transmission, ProX offers a growing range of high quality components. A complete line of front and rear sprockets, drive chains, countershaft seal kits, chain rollers and sprocket bolts. We offer aluminium and steel rear sprockets and we offer our drive chain in a standard and gold colored version. The perfect match! 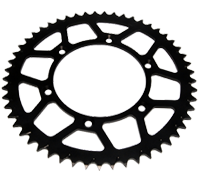 Check out the ProX catalogue or product search on the home page to find the right front or rear sprocket, sprocket bolt set drive chain and/or countershaft seal kit for your bike. ProX offers a complete range of front and rear sprockets. The perfect fit together with the drive chains. 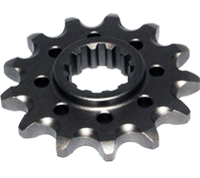 The front sprockets are grooved and ultra-light and are the top level quality sprockets. Manufactured from low corrosion SCM435 Ni-Chrome Molybdenum steel, featuring a low carbon core to prevent breaking while the case hardened surface offers maximum wear resistance. Precision CNC machining ensure a perfect fit and the lightweight design including lightening holes offer ultimate performance. 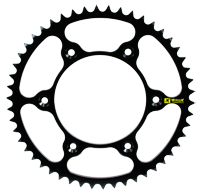 The sprockets also come with self-cleaning dirt grooves to extend chain and sprocket life to the max. 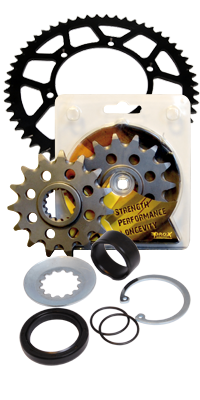 ProX offers a complete range of front and rear sprockets. The ProX alloy rear sprockets are all manufactured from high grade 7075-T6 material. The total sprocket is precision cut on fully automated CNC machines using strict tolerances which guarantees perfect fit. The sprockets come with self-cleaning mug grooves. Unlike many other rear sprockets, the specially designed mud grooves are positioned outside the pressure area of chains and sprocket to significantly increase durability. ProX Racing Parts Ultra-Light steel rear sprockets all manufactured from premium quality “Qste 420 & 460” high strength steel and offer superior durability, even under the most extreme riding circumstances and will last 2-3 times longer than aluminum sprockets made from T7075-T6. ProX rear sprocket bolt sets contain 6 pieces of M8x25 bolts and 6 pieces of flanged nylon lock nuts. ProX has developed a premium line of Roller Chains to team up together with the ProX front and rear sprockets. The ProX Roller Chain is a top quality chain, exclusively manufactured for ProX by the reputable and leading OEM factory in Japan. All ProX chains are made using highest grade Japanese steel. The MX chains are assembled out of various different components that all have their specific and crucial function to make the chain a high quality product. 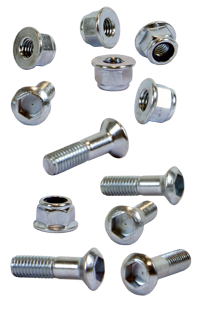 Pins do feature an exclusive pin treatment providing an extremely hard outside coating, leaving a softer inside to increase strength while reducing overall chain wear. The pins are heavy press fitted and do feature quad staked riveting for ultra-strong connection. The solid bush inside the shot-peened, solid roller and plates are all heat treated to offer an incredible tensile strength in combination with low friction and high wear resistance. Inner plates are designed in a specific shape allowing less material to be used which in combination with the unique lightning holes results in a 3% overall lighter chain without compromising tensile strength. Specifically for the Off-road, Enduro, ATV and big 4-Stroke Motocross bikes ProX also offers a lightweight, narrow type X-Ring chain using a QX-type seal offering 40% less friction and at least 150% increased durability over a standard MX Chain. 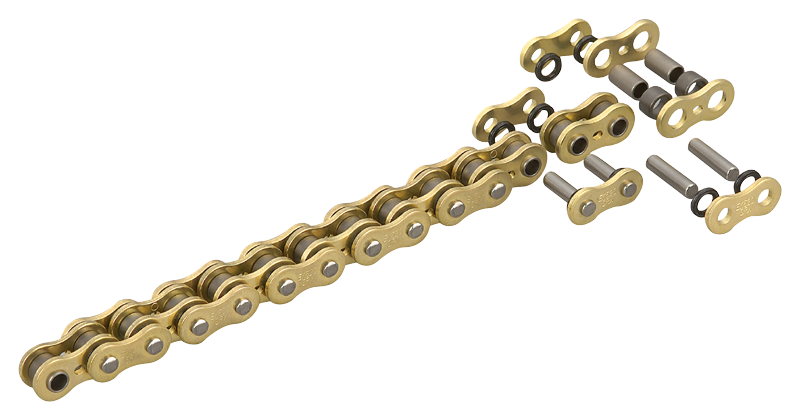 All ProX chains are pre-stressed and pre-stretched to reduce initial chain stretch and immediate performance and come with a clip type chain link as standard. While changing the front sprocket it’s always recommended to inspect the countershaft oil seal that’s right behind the sprocket. Positioned on the high loaded countershaft and always in contact with dirt and water the oil seal can easily start leaking. 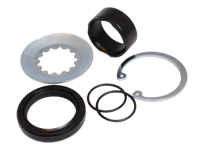 ProX has developed a wide range of countershaft seal kits. These kits are an easy and complete replacement offering all the needed components and at the same time it is an upgrade kit resulting in improved durability against the OEM parts. ProX offers a complete line of OEM replacement and universal chain rollers for the Dirtbike program. The ProX chain rollers are manufactured from special Polyurethane material which offers superior hardness to guarantee long life while sealed precision bearings have 2 additional outer seals to protect the bearings against water and dirt. The ProX chain rollers are one of the longest lasting chain rollers available on the market ! The high-performance self lubricating nylon OEM replacement chain rollers will fit directly to the frame boss.